Neuropol is a wide, starkly futuristic typeface which was created in 1996. The design is based on rounded squares which were popular in earlier techno fonts such as Microgramma, Digital and Chimes. The superelliptical stroke ends give Neuropol a harmonized appearance. Truncated horizontal strokes suggest lasers or vector-beam traces. Over the last few decades, several Neuropol related font families have been released. Neuropol had been redrawn and expanded into Neuropol X in 2004. 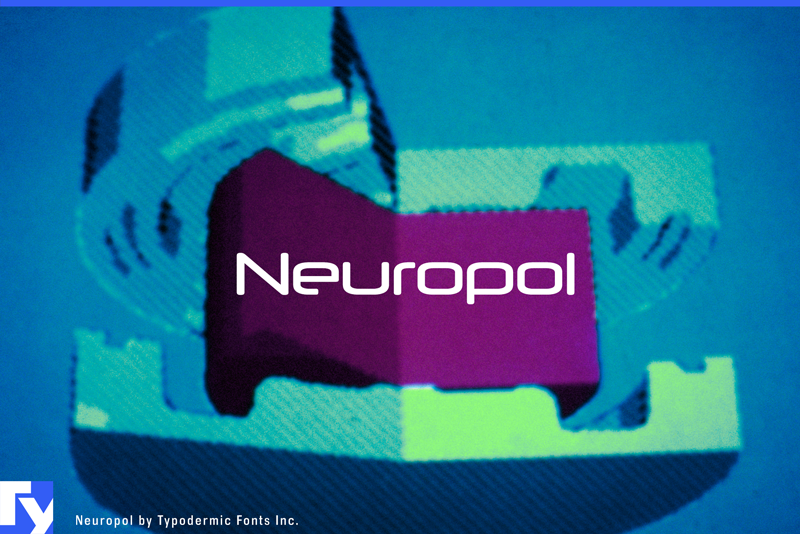 The original Neuropol font was discontinued at that time but some people still pref the 1996 version. In 2015, the original 1996 Neuropol was restored and re-released. Changes include: better kerning, higher dots on i and j, cleaner curves, heavier accents, more languages, more punctuation, the latest monetary symbols and a better @ symbol. If your application supports OpenType stylistic alternates, you can access a complete Z, similar to the one in Neuropol X.